If you have been looking for a replacement board for your original XF551 Floppy Drive device, look no further. This board allows you to reuse most of the original parts. It also has the ability builtin to have 2in1 OS, and connections to attach an internal SIO device and output signals for OS, Reset, Drive # Selection and Track Display. It is a bare pcb only. You will need to scavenge some parts from your original XF551 and since some of those parts have a unique part footprint, you may not be able to substitute with more modern parts. More details are available in the BOM and Assembly pdf attached. 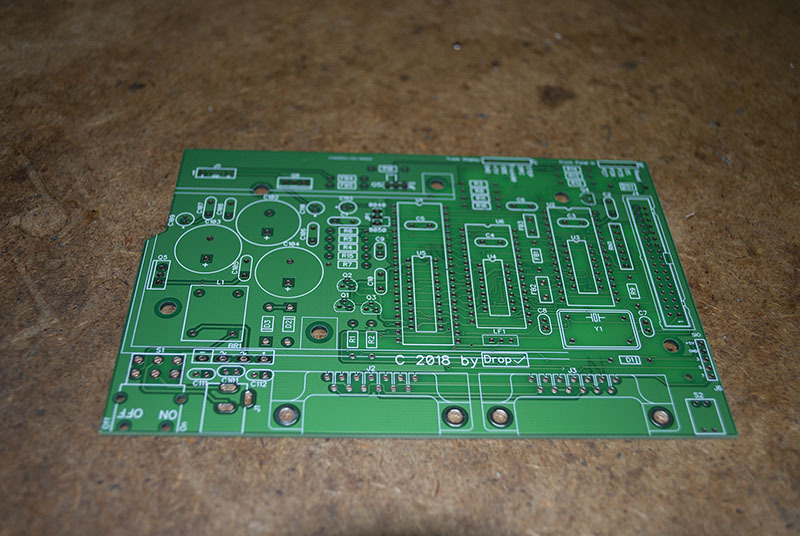 I currently only have 1 pcb in stock, but if at least three are backordered, I'll do at least one run of 10 boards. The time from ordering to mailing will be around one month. It's hard to guessimate because it might take just a few days to weeks to hit the minimum backorder. Board can be ordered from my website. I bought the one you had in stock. How does this board compare to the older xf re-imagined board? Essentially the same. Except this version is geared more towards using salvaged parts from an existing board. except I can't get onto your site. It says I am registered but I have no record of doing so. All I can say is that at some point you did register. And forgetfulness is a blessing sometimes. Did you try to reset your password? If you can't, let me know and I'll do a manual password reset for you. If somebody of the ABBUC who comes to one of the meetings that I usually visit places an order, please order one for me too. Shipping and handling cost is preventing me from ordering one myself. I know Lenore isn't to blame for this!!! I asked for a reset but no e-mail. Can you just set my password back to abc123 again? Apparently that postage cost is about to get even worse. Mathy, alternatively you could contact AtariPCB.pl. He sells his own version of XF551 pcb replacement. Interesting, but it just seems to be gerber files, not the pcb itself. So you would have to send off to have them made. And there is the indication that the resulting board is not tested. did it not occur to you that .58 thats cents for 75 diodes shipped from china to the USA meant someone was getting screwed? Shipping from the US to CHINA has always been ridiculous, anytime you ship from the USA to somewhere else it is pricey as all get out but get something from CHINA to USA costs nothing and you can see something ain't right. I would suspect that once there is a real negotiation the prices will come down for some countries and go up for others as they actually pay what it costs to ship. The reason why the shipping is so d*mn high to and from some countries is because someone has to pay the upkeep on ships, planes, trains, and all the people that move, maintain and handle every part of it. Just think about how much poland, slovakia, usa, and britain have been raped to cover their costs. The breakdown of other countries can even be worse! Say what you will, but I am all for CHINA paying at least the cost of shipping (that's not even profit bearing, just the cost). It will take some time for the rates to come down after the shake up, but afterwards I will enjoy getting much more goods from our friends overseas, just not so much from china. Why does the world subsidize the 2nd biggest economy on the planet? There is a lot going on. I wonder if my 75 diodes costing 1.58 would kill me, or if I would just order my diodes with leds and transistors so they all make it into that 1.00 e packet.. They sky is falling again, the world is ending, Grandma off the cliff commercials start playing omg omg omg. Edited by _The Doctor__, Thu Oct 18, 2018 12:27 PM. It's called extreme capitalism. Make the shoe as cheap as possible and sell as many of them as possible. Avoid as much tax and fees as possible. Move jobs to countries with lower labor and raw material costs. Anything to garner market share and make more profit. That's the American way. We've been doing that for generations. Why are we surprised when the Chinese copy us? The only real solution is Star Trek matter replicators. No more shipping costs except for the raw materials. Except the Chinese will probably develop them first and the only raw material source will be in China. nah they'll just wait for our universities or companies to figure it out and then steal it... then sell it to us.. if slick willie stopped it when it started going full steam we wouldn't be here. Your correct about one thing. Some one will think, hey lets add that 'extra' money to this program we have to help blah blah and then the price won't go down.... and the pensions will still be collapsing. Come on boys we got turtle tunnels to build and the shrimps needs treadmills under the sea! I don't mind capitalism so long as it doesn't turn to pure unadulterated greed, selling out ones country isn't capitalism, it's treason.... Yankee doodle starts playing soap boxes pop up.... kissing of babies, with puppies and flowers. Edited by _The Doctor__, Thu Oct 18, 2018 5:41 PM. But America would never steal ideas from someone else . Sometimes it just cracks me up how we think we are the only ones that can come up with good ideas, and that everyone else is just too stupid to do so on their own, meaning they have to resort to stealing them instead. Maybe this is how things are in the beginning, but it seems like people no matter where they live, eventually come up with unique ideas on their own. Heck the way you learn anything, is by initially copying others, and then eventually improving upon those same ideas. Steve Jobs is famous for doing that. Well Bill and Steve would NEVER steal and litigate later... never... sarcasm alarm melts down.. I am not in the habit of excusing bad behavior by citing other bad behavior... well bobby did it ! so did jeffrey dalmzer! so it's o'tay! You won't catch me quoting the exception to the rule as the rule, nor will you catch me quoting the rule as the exception to the rule. I leave that to the politicians. Bottom line is no matter which side of the fence you live on or associate with, this trade war will certainly result in prices going up on the products a lot of us on AA buy. As to who will benefit, I personally don't have a clue, but I definitely know it won't be me. This hobby already costs a considerable amount as it is, so having to pay more for stuff that I use in my R&D won't be welcome, nor helpful. If this all had a happy ending, I really wouldn't mind so much, but I doubt anything good will come of it. If I'm wrong about this, I will be the first one to say I'm glad I was. Anyway I apologise for being wayyyy off topic with my last post and this one, and will now cease and desist. Well after the next paragraph... .
BTW, I agree that once shipping costs go up, they rarely ever come back down. I remember well several years back the shipping companies justifying a substantial increase in shipping charges to counteract increased fuel costs. Funny thing is that even when that reversed and gas prices dropped about a dollar or more per gallon across the country, and stayed so for a several years, shipping not only stayed high, but increased across the board. And I'm not talking about USPS only, all 4 major carriers failed to lower costs even on domestic shipments. Call me a pessimist. As it stands I have one order for 2 XF551 boards. That's only 1 short of getting at least 10 boards made and available for purchase. I will probably grab one as well, I have one XF board that's giving me a pain. Do I just order it on your webpage, and it ships whenever? I once bought boards from you, which in the end turned out not being such a wonderful deal as I once hoped. The problem with your re-imaged boards was, that I thought that the 'original' type would be a 1:1 copy of the original board, which turned out it wasn't. (The re-make board did work finally, but the so called original board never worked at all). Is this board a 1:1 remake, or did you change things to the original board again? As long as the new board isn't made with 1/10 ounce copper traces and pads like the oribinal, I'm willing to fiddle a little. Worst case is it takes some time. I've got a lot of bad XF551s that need new boards. Hate to toss them out. I never said that any of my reimaged XF551 boards were 1:1 copies. They are not and never were. Some of the parts for the original Atari XF551 were no longer available at the time I designed my boards so of course I designed with then available parts. However I tried to keep the footprint the same and used as close to the same parts as possible so that the user had the least amount to do to install the new board. On the original power supply versions I offered you had to remove your old board, salvage the heatsink, screw the provided 7805 regulator to the heatsink then solder it to the new board and install it into the existing case. On the new power supply versions you had to purchase a DC adapter, remove the old board and install the new one and then use the new DC power adapter. I tested the board as best I could using US 60HZ power supply prior to shipment. However I did have an issue with an error in the power supply design in version 1.0. It allowed the board to read under most circumstances but not necessary write. Boards exposed to 50Hz power supplies seemed to fair worse. That error was fixed in later pcb versions. I offered to replace those boards or the buyer could do the fix themselves with the information I provided. I remember well the time and trouble we had with your boards. I'm sorry again for that trouble. This board is not a 1:1 copy. It does function the same and use some of the same original Atari parts and has the same overall footprint. There is a BOM attachment in my first post. I have built a working modeI, but I cannot guarantee yours will function. NO one could. Mainly because I am not assembling or testing the board prior to shipment. I have no control over the parts used or the person's soldering skill or lack there of. I have no control over the drive mech or the power supply you use. In short all I can be responsible for is that the pcb is wired correctly. It is. The traces need to be beefier near the sio ports and power ports... as that generally would follow beefing up wherever one could only helps in all ways for such a replacement board. A better way to express this would have been to ask Lenore to please make a beefy replacement board so we can move all parts over and put these piles of XF 551's back into service. As stingy as I can get with dollars, I'd buy a couple of that kind of PCB as would most. I'll be the first to ask. Lenore, pretty please with sugar on top, could you whip up some XF 551 beefed up trace direct replacement boards for the community. We love your help in all these crazy Atari devices.Only you can put the tlc into this that makes it extra special to us. Einstein whimpering with anticipated approval. Edited by _The Doctor__, Tue Oct 23, 2018 1:52 PM. The bridge rectifier cannot be used from the original board, but is only about a dollar on Mouser.com. I would not reuse the transistors for anything. Again those parts are about .15 cents per. Due to stacking of some chips you will need to buy 1 40pin and 2 28pin IC sockets. If you are careful and diligent you should be able to salvage and use almost all the other parts. Of course the assumption is that all the parts you re-use are good. The BOM pdf gives you specific part # and values for each part reference #. Most problems were caused by the cheap one sided pcb that Atari used. There is an issue with attaching the SIO connectors to the pcb. On the assembled boards I sold earlier, I was using a plastic rivet system that seemed to provide the needed stableness. The source for that was from Ebay and has since disappeared and I only have four or five rivets left. Based on my measurements you should be able to use a nut/bolt system. Bolt should have a 9/64 inch diameter shaft with between 5 mm and 8 mm length. Nut should fit the bolt. The head should have a diameter of 11/64. I'm sure others maybe able to offer other options.